Thanks to a $10,000 State Trustees Australia Foundation grant, Bendigo will soon have a new custom built studio space for artists with a disability. The Scope Victoria Golden Art Space is one of just 22 selected from across Victoria to share in nearly $200,000 through the Foundation’s annual Grassroots Grants. Funded through bequests and donations and administered by State Trustees, the Foundation provides the annual grants which support social inclusion for people marginalised by age, disability and mental illness. State Trustees General Manager Operations Angela Burton said competition for the grants was very tough and it was particularly pleasing to support such a worthy local project. “The grants encourage people who are marginalised by age, disability or mental illness to participate in social, economic and family life,” Angela said. Scope’s Loddon Mallee Customer and Service Delivery Manager Mary Sullivan welcomed the grant which will help to empower people to explore their artistic skills and perhaps even exhibit and sell their work. 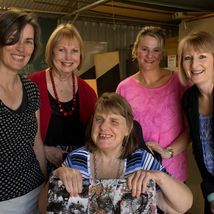 “Scope provides disability support services across the Loddon Mallee and Scope Golden North recently identified that many of the people we support have goals and aspirations relating to designing, creating and selling their art,” Mary said. Celebrating its 20th year, the State Trustees Australia Foundation has provided more than $2 million to more than 250 projects through grassroots grants. A further $10 million has been provided directly to charitable organisations. The Foundation has also recently established a ground breaking Ageing, Disability and Mental Health Collaborative Panel bringing peak bodies together to identify critical transitional opportunities following significant sector reform. The panel is currently identifying collaborative opportunities and resources and is shortlisting priority areas for a new larger strategic grants program from the State Trustees Australia Foundation to be launched in 2015.